dressed up like a lady: Gypsy or hobo? This question is always at the forefront of my mind when I dress like this. Necklaces and bracelets: Etsy, mom, thrifted, etc. Hobypsy. Gyobo. One of those. Wearing a Cure T-shirt instantly elevates literally anything you can wear up into the cool stratosphere. That's just a law of nature. I guess my taste is stuck in the grunge era because I still love this look on women. Hobo it up any time. I approve. As far as I remember this look is your most eclectic and cross-over looks ever. It is very different... Almost like someone did not want to wear jeans with a t-shirt and shoes coz everyone is doing that.. and hence ended up with unique look. 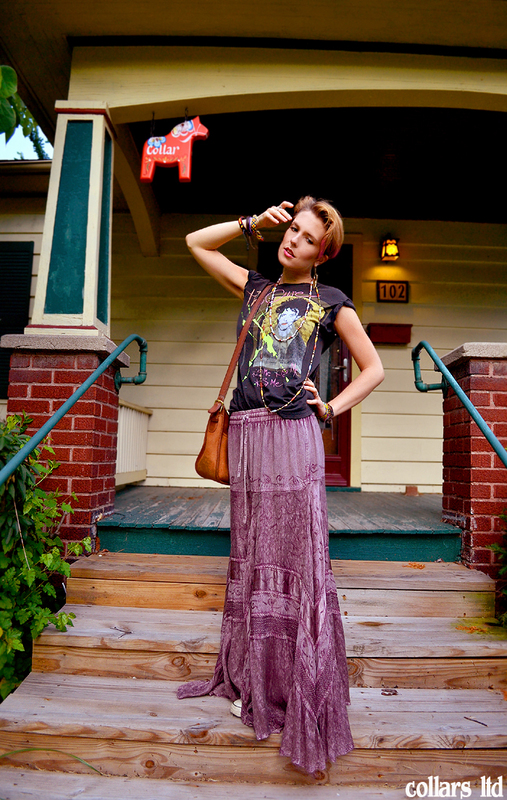 Far from hobo, I think this look is a fantastic mashup of boho, gypsy and femme rocker. It's so summery and free spirited - the sort of thing one would want to wear to a long weekend music festival. omg i am so in love with that skirt! its stunning! i love the colour and the way it falls! arg just everything... love it... want it!!!!! Hobo or Boho is tough... on the one hand your shoe's are untied, so that says hobo. 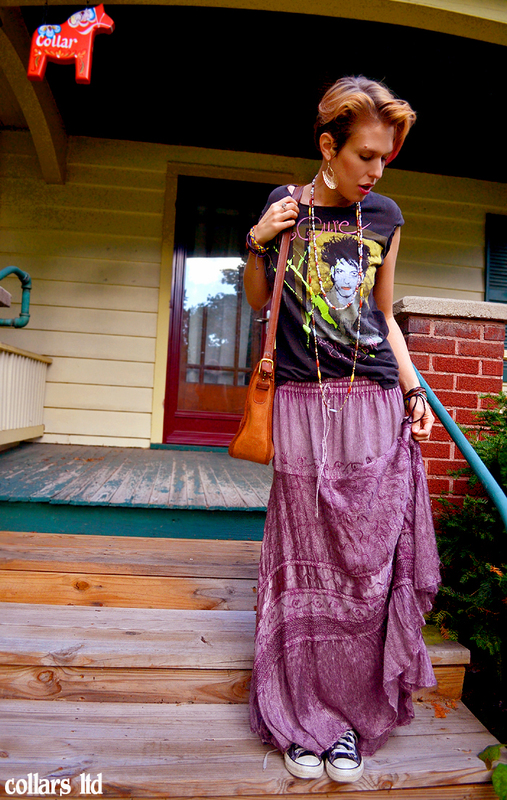 On the other hand, you're wearing a most awesome Cure shirt, lipstick and a pretty rad skirt, plus you're adorable. 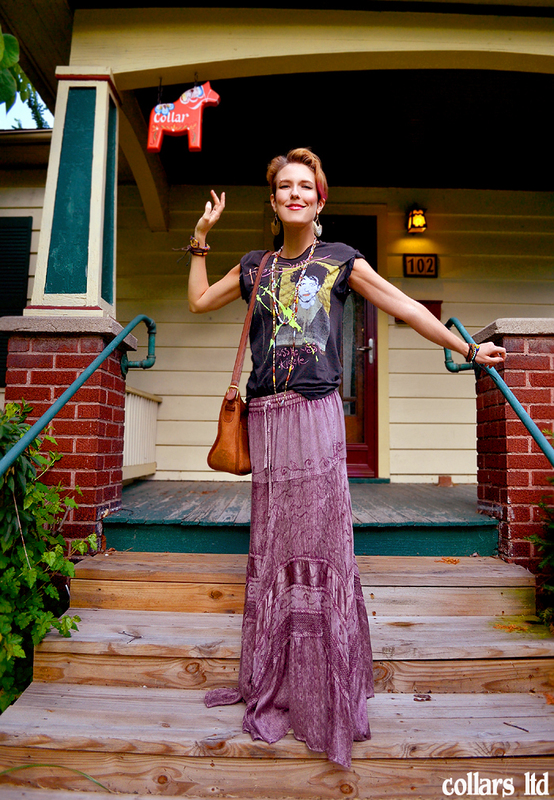 Boho wins!